I’m the kind of person that just wants to determine at the last possible moment wether to go out for a shoot or not. Checking the weather and hoping for those perfect conditions… It has made me miss a lot of awesome opportunities just because it did not look promising enough and then mother nature was in for a surprise. So you just got to go for it. Me and a friend wanted to hook up and shoot together so we just planned a evening that fitted our busy schedule and just went for it. We got lucky. 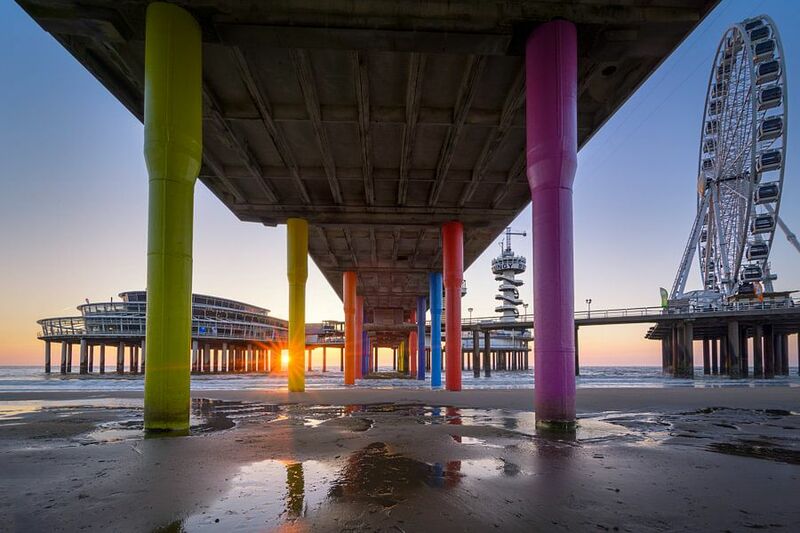 We had set our mind to go to Scheveningen and shoot the famous Pier. Accidentally the weather was really nice for a change and even the tide was low so we almost had perfect conditions. If only there would have been some clouds… But there weren’s any so you just have to make with what you have. Knowing Scheveningen because I’ve been there many times I knew where to park and how the Pier looks and how to get there. But I did more homework. I looked online on sites like Flickr and 500px for different angles and what kind of shots I would like to have. I knew I wanted at least a shot of underneath the Pier like I did last time I was in Scheveningen. And I wanted to do something with the movement of the waves rushing over the beach in the foreground. When we came up to the pier my friend started shooting underneath and I took a shot underneath the pier as well. Then I started to walk around and just when I had set up to take a shot on the right side of the pier I noticed the pillars casting shadows on the beach because of the low angle of the sun. I readjusted my composition so that the light of the sun was going to reach my position n minutes and waited… I knew that if the sun is partially hidden and the aperture is low enough it will create a sunstar and I love sunstars!!! After a minute or so the sun peeked behind one of the pillars and boom I started shooting. I bracketed my shots because I knew I would want to blend in a proper exposed sunstar and some proper exposed shadow area’s in post production. Another edit from this weeks trip to #Scheveningen. 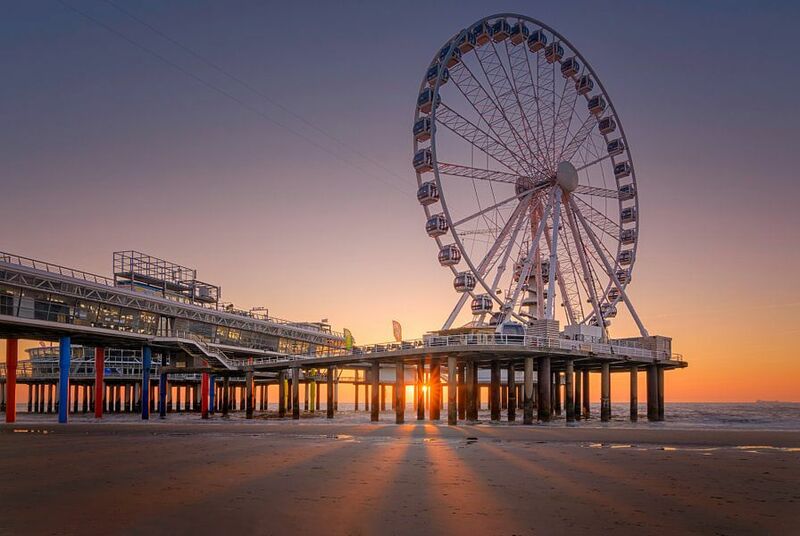 The Ferris Wheel on the #Pier during sunset. round an road we go!!!! I was attracted bij the play of light and shadow on the ground as it makes for nice leading lines into the frame. First result of yesterdays photoshoot over at Scheveningen beach… A classic composition with motion of the waves in the foreground. more shots coming up so stay tuned. In the mean time the sun had set and we had planned some long exposure shots on the harbor head so we started to head out that way. Every other step we stopped and took some shots of the breakwaters, the awesome Kuhrhaus wit the rising moon and the Scheveningen Lighthouse. All shots we didn’t plan on taking but while we were there we better make the best of it. So which one is your favorite? let me know! I’d love to hear!